Tobacco addiction is among the leading preventable causes of morbidity and mortality in Florida and in the United States. Cigarette use, alone, results in an estimated 430,000 deaths each year in the US, including 28,700 deaths in Florida. Tobacco use is the single largest cause of preventable premature death in the United States. The adult smoking rate in Pinellas County is 19.3% which is above the state rate which is 17.1%. The list of illnesses caused by tobacco use is long and contains many of the most common causes of death, including heart disease, stroke, many forms of cancer and lung, and vascular diseases. The tobacco industry spends close to $1 billion in Florida annually to market its products. The Florida Department of Health in Pinellas County's Tobacco Prevention and Control Program will provide technical support to help in the creation and implementation of tobacco free policies to reduce tobacco use, encourage youth to stay tobacco free and reduce exposure to secondhand smoke. The Tobacco Prevention & Control Program receives grant money to mobilize the community to establish policies supporting long-term, social norm change. The major goals of this grant are to reduce the prevalence of tobacco use among youth, adults, and pregnant women; reduce per capita tobacco consumption; reduce exposure to secondhand smoke and reduce tobacco-related disparities in Pinellas County. Through the teamwork of the Tobacco Free Coalition of Pinellas County (TFC), Students Working Against Tobacco (SWAT) and the Florida Department of Health in Pinellas County, communities are working to prevent youth from smoking, assist smokers who want to quit, and educate parents on the dangers of secondhand smoke. 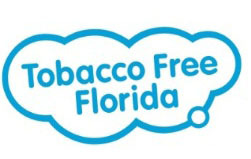 In addition, through the Florida Department of Health's Bureau of Tobacco Free Florida, funding is provided to create tobacco free environments in Pinellas County. Select the link below for specific information on the current initiatives of the Florida Department of Health in Pinellas County's Tobacco Prevention & Control Program. TALK TO A QUIT COACH® TODAY TO BEGIN YOUR JOURNEY TO BE TOBACCO FREE. 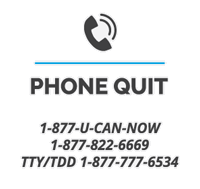 Call Tobacco Free Florida at 1-877-U-CAN-NOW (1-877-822-6669) to speak with a trained Quit Coache who wi ll help you assess your addiction and help you create a personalized quit plan. You'll have access to a Quit Coach® 2417, and you'll receive three free personal coaching sessions, scheduled at a time that works best for you. You'll be eligible to receive a FREE 2-week starter kit of nicotine patches, or gum, if medically appropriate and 18 years of age or older. YOU'RE NOT ALONE. 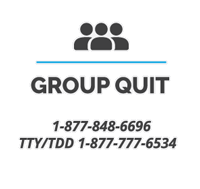 JOIN A GROUP QUIT SESSION AND GET THE SUPPORT YOU NEED. 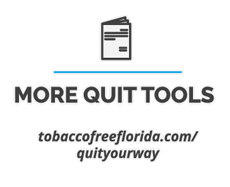 If you are looking for face-to-face help in a group setting, Tobacco Free Florida offers free resources through our Group Quit sessions. We'll provide you with support and guidance, led by a trained specia list. We offer sessions in all 67 counties in Florida at convenient times and locations. You'll be eligible to receive a FREE 2-week starter kit of nicotine patches, gum, or lozenges if medically appropriate and 18 years of age or older to help you become tobacco free. Call 1·877-848-6696 to sign up for a group near you. FOR THE DO-IT-YOURSELFERS THERE'S WEB QUIT, AN ONLINE RESOURCE THAT GIVES YOU ACCESS TO TOOLS, TIPS AND SUPPORT TO HELP YOU QUIT TOBACCO. Many people prefer to quit on their own, but they're looking for a bit more help and guidance to quit smoking. 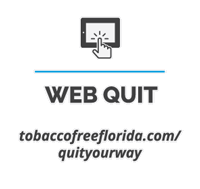 Tobacco Free Florida has an online program called Web Quit that has proven to work for many people. This free online program helps you create a personalized web-based quit plan that you follow at your own pace and in private. You'll have access to Web Quit, where you'll find 2 weeks nicotine patches or gum, a progress tracker and blogs where you can share your story. You'll be eligible to receive a FREE 2-week starter kit of nicotine patches, or gum, if medically appropriate and 18 years of age or older. BUT WAIT, THERE ARE MORE WAYS TO QUIT! HERE ARE SOME QUIT TOOLS TO HELP YOU GET STARTED. You can sti ll access FREE tools to get you started. Choose one. Choose two. Choose as many as you need. Or use them in addition to our Phone, Group and Web services. Receive a 2-week starter kit of free nicotine patches, if medically appropriate and 18 years of age or older, texting support, a quit guide, or helpful emails.